The HBP board has adopted a proposal to work in future more closely with Hebden Bridge Community Association (the association which runs the Town Hall) during 2018, and also to recognise that some areas of its previous work - to do with spatial planning and project development - are now being undertaken by the new neighbourhood planning process, and the Hebden Bridge & Mytholmroyd town board. Details of this proposal were shared with members at the recent AGM. The partnership’s new remit is now more focused on facilitating discussion and cooperation between Hebden Bridge’s other principal organisations, and assisting the activities of its some 60 member organisations. It is holding three public meetings in 2018 - on 14th February, 11th June, and 22nd October - to help make that happen. Our annual Hebden Bridge: Our Town review of the year (combined with our AGM) will be taking place this year on Monday 22nd October 2018. As in previous years, local community groups and organisations are invited to participate. The tradition is that every group gets 2½-3 minutes to report on their activities and plans. To book yours contact info@hbpartnership.org.uk now! This year's AGM includes a proposal to change HBP's articles of association, removing the block on directors serving more than two consecutive terms, on which members will be able to vote. The access initiative, Making Hebden Bridge Accessible for All, which has been run jointly by Hebden Bridge Partnership and the Community Foundation for Calderdale has now concluded. There is much still to do to make our town an exemplar in terms of access, for both local people and visitors with disabilities, but we feel that the project has been a success. Over thirty access audits have been carried out with the participation of local businesses and organisations, and a number of grants have subsequently been awarded for small-scale improvements and remedial work. If you had an audit undertaken, it is still not too late to apply for grant support from the Foundation. 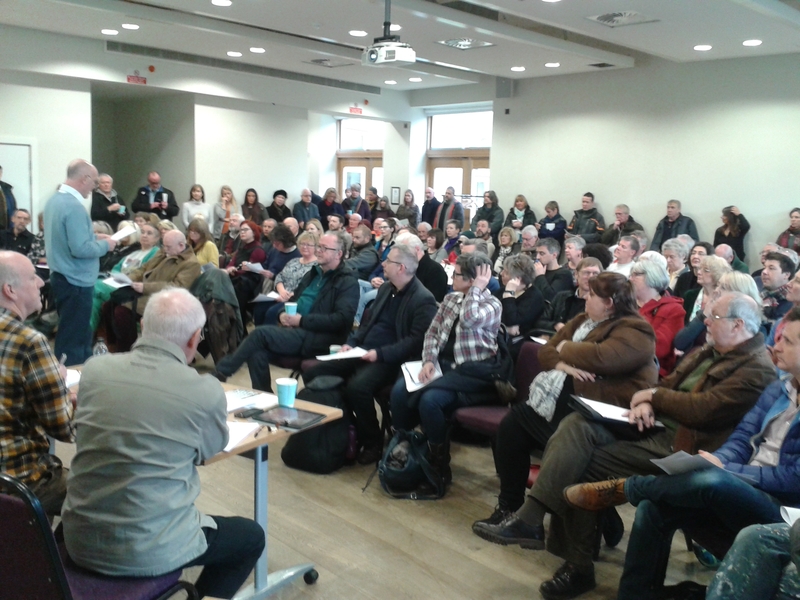 Our flood recovery meeting on Saturday January 16th 2016 packed out the Waterfront Hall (Photo above). analysis of the effects of the floods (Bob Deacon). 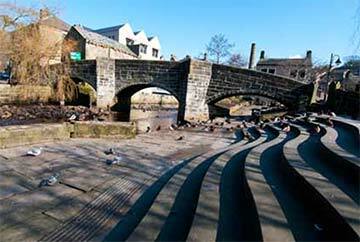 Hebden Bridge Partnership is the ‘town team’, concerned with initiatives to improve the economic and community life of our town. and was amended in the light of feedback and comments. Details of all comments received can be found on the website. Our 2016 Annual Report is available here. 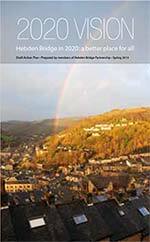 For the fifth year running, the Partnership has produced our highly popular Hebden Bridge brochure for visitors and tourists. The 2018 edition is here. Hard copies can be obtained in the Tourist Information Centre.